- Supports Plastic Fiber - Multimode and Glass Fiber - Single mode /multimode experimental setups. - Allows finding of IV and IP characteristics of Laser diode and IV characteristics of LED. - Allows finding of laser threshold. - Soft start for Laser prevents damage due to spikes in power supply. - Sine and triangle signal source with variable frequency and amplitude. - A switch to select sine or triangle signal and connect to the transmitting circuit. - A variable POT at the transmitter offers the intensity adjustment. We are one of the best manufacturer of fiber optics trainer kits. Study of attenuation in an optical fibre. - To study the transmission of analog & digital signal through fiber optic cable & also caculate numerical aperture, propogation loss, bending loss & voice transmission. - Recovery of Modulating Signal from Receiver Circuit. 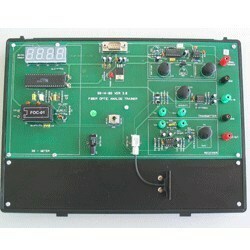 We are a emerging Supplier of fiber optics trainer kits. i) Peak wavelength of emission 660 nm Red visible (IF-E97 or SFH-756).